During the event, the activities of the three Institutes and EKT, their achievements and their prospects will be presented. 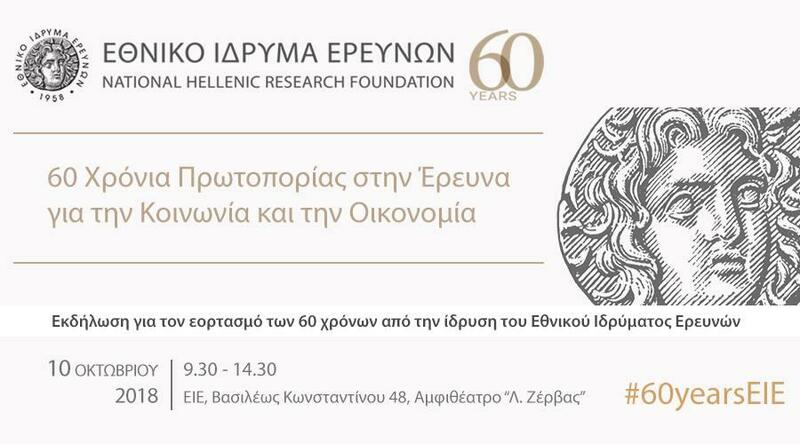 The National Hellenic Research Foundation (NHRF), one of the biggest research centres in Greece, is celebrating its 60th year. The main event of the celebration will be on Wednesday 10 October 2018 and will feature the research actions, the achievements, and the prospects of the Foundation. The event will be held from 09:00 to 14.30 in the L. Zervas Amphitheatre (48, Vas. Konstantinos, Athens). Admission will be free. NHRF, as an interdisciplinary research centre, is comprised of the Institute of Theoretical and Physical Chemistry (TPCI/NHRF) | the Institute of Biology, Medicinal Chemistry and Biotechnology (IBMCB/NHRF), the Institute of Historical Research (IHR/NHRF) and the National Documentation Centre (EKT). With significant activity in Humanities and Science, the NHRF has been at the heart of the modernisation and development of science, with research projects which ensure the international presence of the country and foster openness and scientific development. With constant orientation in research work related to society and the economy, the NHRF is actively involved in promoting dialogue for the future of research in Greece and its relationship with production. EKT, the central national infrastructure for the dissemination of knowledge produced in the country, uses its cutting-edge technology, quality expertise and specialist skills, to be instrumental in showcasing the digital wealth of Greece. As a national authority of the Hellenic Statistical Authority (HSA), EKT produces and publishes the official national statistics and indicators for Research, Development and Innovation, collaborating with the HSA, Eurostat and the OECD. It also provides enterprises and researchers with customised information services to exploit funding opportunities, help in using research results, and create bridges between research and entrepreneurial communities. It is in the above context that the National Hellenic Research Foundation will be opening its doors to the public so that they can learn about its research and development activities, its printed and digital publications and applications and its services for the research and business communities. All those attending the event will be free to browse the permanent exhibition space on the NHRF’s ground floor, where the activities of the foundation from its beginning to the present day, along with the latest accomplishments of the three Institutes and EKT will be on display.